Now you also get to wear Pentel instead of just using to write! Why? Because Pentel Sign Pen was chosen to be part of Uniqlo “The Brands Masterpiece” collection! The Uniqlo “The Brands Masterpiece” collection is made up of Brands’ classic products that have been loved by many throughout the years! And for Pentel, our masterpiece is our Pentel Sign Pen which was launched in 1963. Fun Facts about Pentel Sign Pen! – It was former US President, Lyndon Baines Johnson’s favourite pen. – Chosen as the official writing instrument of NASA and landed into space with spaceship Gemini in 1966. 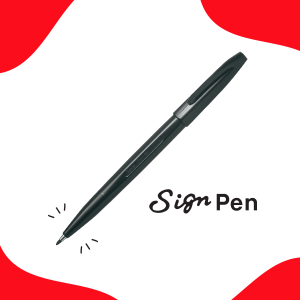 – More than 2 billion Sign Pens have been sold around the world!